Looking at this cartridge brings back a lot of memories. Yep. There it is. The box and instructions and everything. I remember being pretty bewildered by how small Game Boy games were back then. 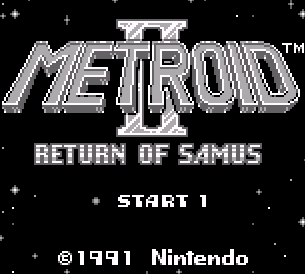 Since we just got the announcement of a new Metroid 2 remake, I figured it was time to revisit this post. 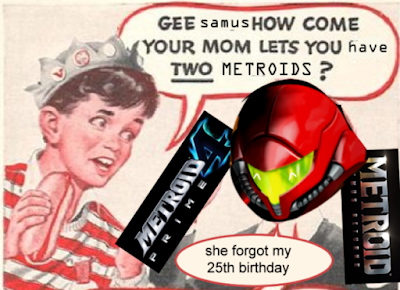 Nintendo forgot a lot of Samus birthdays. This game starts with a scene that is nearly as iconic as the columned blue Brinstar elevator at the beginning of the original Metroid. Samus now has the ship she'd be known for having in the future. Wouldn't have minded seeing the origin of the ship, but at least we got the origin of the power suit. It almost definitely isn't coincidence that the ship and suit have a very similar visual appearance. The changes are apparent right off the bat. Samus has officially learned how to crouch, a skill that was absent from the original Metroid. You don't realize how important a game convention like ducking is until you don't have it. While playing Metroid I frequently found myself unable to do anything to a low-to-the-ground enemy that was creeping towards Samus, instead having to avoid it or wait for it to get to a slightly higher elevation so I could actually hit it. After that experience, I won't be taking the ability to duck for granted ever again. Samus also starts with the morph ball, which is another cool change. It's like starting with the dash in Mega Man X2 and onward; you might as well, and it's really useful right out of the gate. Lastly, you start with missiles. 30 of them, no less. 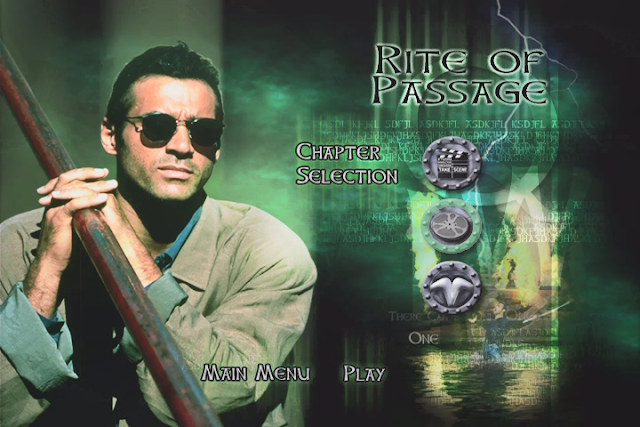 This game definitely starts you better-equipped than any of the other games in the series. At least Metroid Prime starts you off with powerups for a few minutes, then explains their absence in the early-game. Other than that, they mostly start you out in a bare-bones state with none of the power-ups Samus found in previous games. The enemies in this game, much like those of the original, tend to follow set movement patterns. These toads, for instance, hop back and forth in a pretty steady way. The only enemies in this game that actually react to the player (i.e. move towards you or alter their movement in any way at your approach) are the Metroids. Being able to fire downwards is another huge improvement over the original game. 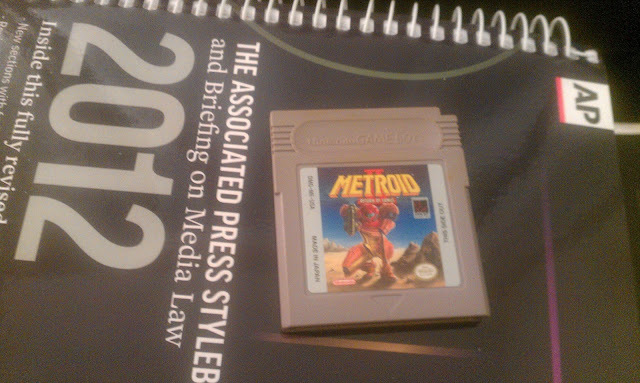 Lo and behold, a Metroid! Samus doesn't have the ice beam at this point, so she's effectively screwed in this battle. ...BUT WAIT! It undergoes a metamorphosis, turning into an Alpha Metroid. 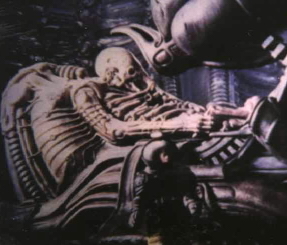 It turns out that the iconic face-huggers from the original game are just the larval state. That's the most efficient form for survival on worlds that they aren't native to. Here on planet SR-388, they're allowed the conditions they need to grow and evolve into new forms. Weirdly enough, the Alpha Metroid is far less threatening than the larva, taking a mere five missiles to kill and not requiring a freeze beforehand. When I was a kid playing this for the first time (and playing it on a tiny Game Boy screen) I thought that this was some kind of malevolent clown face. I guess I can kinda see where I got that idea, but it's also plain to see that the Alpha Metroid is actually some kind of flying tick with a big nucleus-sack under it. Is that nucleus the brain? The heart? No one knows. In any case, the Alpha form is a big step down from the larva form. After that fight, 38 Metroids remain on SR-388. That's what the lower right counter represents. Here we see the Lava Pit of Doom. When I played this for the first time, I got completely stuck at this point in the game. I may have spent days roaming around the first couple of areas trying to find a way to proceed, and it got to the point where I thought I had to somehow get through this lava to reach the next area. I tried numerous times to reach the next area down below, only to have it prove impossible. I didn't treat this like I was playing a game, I treated it like an explorer. At the time I felt like anything was possible in a game, and potentially breaking through or climbing over the walls of the game to bypass entire areas felt like it might be a legitimate way to progress. The next part features ruins, the first of several in the game. These metal doors require missiles to open. When you find one of these doors, you know there's an artifact inside. In this case, it's the Bomb. In 1993 I went around laying bombs EVERYWHERE in an effort to proceed with the game. Little did I know that the game does indeed have plenty of hidden areas to find. Bombing randomly turned out to be successful enough for me to keep doing it. Here's the solution to what had me stuck for so long as a kid. For DAYS I was lost in these ruins. Here's the solution: One of the rooms in the ruins has this nondescript wall-cannon on it. 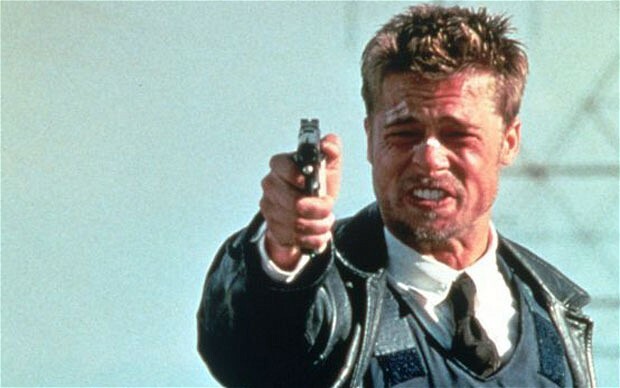 Shoot it and it stops firing, but part of it remains. From there you can climb onto it, ball up, and roll into the wall. Who knew? I discovered this on my own back then, and in retrospect I'm surprised I didn't give up on the game after a while of not being able to figure out how to progress here. It's relatively obscure. This might be the only point in the game where there is only one way to proceed and it's hidden. Typically there are multiple ways to get to where you need to go in the rest of the game. As if I wasn't elated enough to find that hidden passageway, immediately on the other side is the first energy tank of the game. This was an amazing moment when I first played the game, because I had finally made real progress. Shortly after that, the ice beam is acquired. I really like the way these artifacts look. A little beast statue holding a ball in its mouth is inventive, and so are these Chozo statues that are nearly iconic in and of themselves. 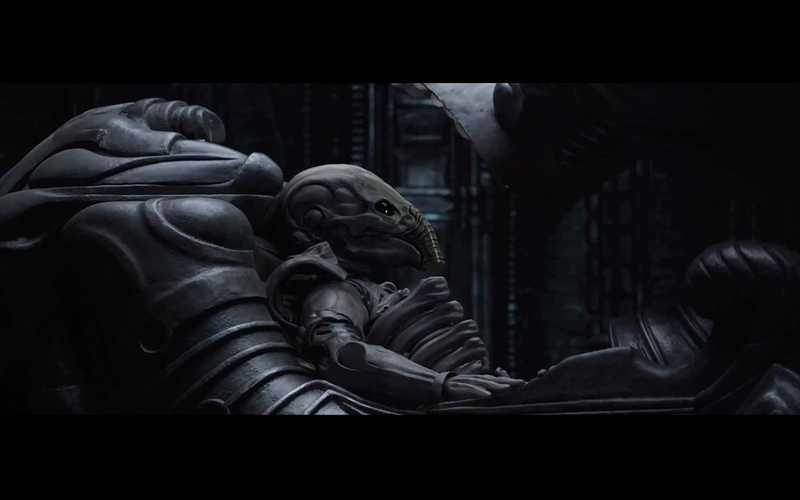 Speaking of the Chozo statues, they really remind me of the Engineer in Alien/Prometheus. Maybe it's the long arms and odd elbows, maybe it's the big, animal-like head. See? Yeah. Also, the idea of the Chozo/Engineers both being an overarching higher species with super-technology. You always know a Metroid is coming up when you see a shed shell. Also, check out the frozen leech on the left. Man, the Ice Beam is one of the coolest weapons ever, pun not intended. The Spider Ball artifact is ridiculously cool, and lets Samus move along any surface (even ceilings) while in ball form. This let me explore everything I couldn't reach previously, and my bomb-laying reached epic proportions. I must have dropped something like fifteen hours in this game the first time I played it, which for me as a kid in the era of one hour games... well, it was like Skyrim or something. Alas, the Spider Ball doesn't show up in any other 2D Metroids. the potential for exploiting it was just too high, I guess. It does show up in Metroid Prime, but only in a limited rail-track basis. I wonder what form this item is going to take in Metroid: Samus Returns. Another Alpha Metroid. These things are actually vaguely threatening when you're almost out of life, as it turns out. With that, the lava clears out from the Pit of Doom and Samus can proceed as scheduled. As a kid I bet I felt silly for my earlier attempts to make it through this lava, but at the time it might have looked like the only way to progress (since the ruins looked like a dead end until I found that passage above the wall-cannon). There's still an eventual impasse, but a nearby shell points you towards the next set of ruins. The game never again gets quite as vague as it was earlier. Fun With Statues. That's no artifact, that's Samus. Possibly the most useful artifact in the game, and one that is highly missable. It cuts damage taken in half and makes Samus' suit into the robust Chozo suit it is known for being. I wonder what it's like to play through the game without picking this up? Not easy, I'd wager. It should be possible, since the Varia isn't needed for crossing any particular areas like it is in later games. Here it's a flat damage reduction and not much else. The Spring Ball is another optional item, guarded by this mini-boss. That's the mysterious Arachnus, which only appears once in this game. It's no Metroid, and it's also easy to beat once you figure out how. Fun Fact: This thing later reappears in Metroid Fusion. Gamma Metroids make their debut here. 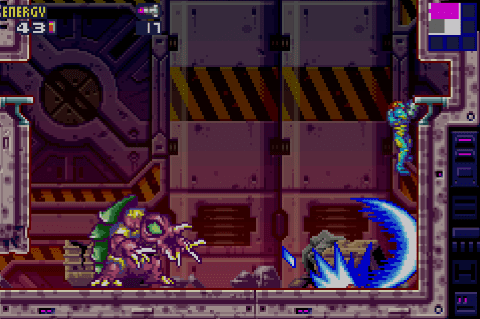 They're much bigger and nastier than the relatively puny Alpha Metroids, and spit electricity for some reason. Here's the Wave Beam. Unlike the original Metroid, it isn't the strongest beam anymore. It's pretty useful for firepower here, but there are better beams in the future. Obtaining it means you no longer have the Ice Beam (for now) though. The power-up parade in this area continues as I find the High Jump Boots and the Space Jump, which together give Samus nearly unlimited mobility. Here we see Samus flying up a wall of spikes. This is the only Metroid game where Samus can space jump straight upward. Soon after the Wave Beam, Samus gets the Spazer Beam. It has the width of the Wave Beam, without the unreliability of the wave-pattern of the shots. The next set of ruins are crawling with autonomous killer robots. Fun Fact: The spiked robot on the left is the only one of its type in the whole game. Weird. It isn't even a miniboss or any other type of particularly special foe. And soon after the Spazer, here's the Plasma Beam. Once the powerups start rolling in, they really start rolling in. Plasma has a narrower range, yet it pierces multiple enemies in a row and generally owns everything in one shot. One could make an argument for the Spazer being better to hold onto, but I wouldn't. The Spazer is easier to aim, but this beam does a lot more damage and the pass-through effect adds a lot. These bizarre-looking rocks are unique to this one spot, and have a cool falling-and-shattering animation when blasted. Surprised they don't show up anywhere else, given the apparent effort put into creating them. They're kinda like that spiked robot earlier. Here's the Zeta Metroid, the next step up from Gamma. Check out how it's shedding the Gamma shell. This thing is like a junior Xenomorph, and I'd argue that it's the most difficult out of the various non-Queen Metroid forms. While the Omega Metroid is still to come, the Zeta Metroid is smaller (thus harder to hit), faster, and a lot more vicious than the Omega. I remember the first time I encountered one of these in the game... it was pretty exciting. As a kid I was blown away by the different Metroid transformations. POW! I get the feeling that different Metroid forms were never in the original vision for the creature as it existed in the first game, and that this concept didn't become a thing until Metroid 2's development. And here is the iconic Screw Attack. In this game it makes an awesome (if slightly obnoxious) buzzsaw sound. It's very useful in this game because it repels nearly all Metroid attacks, effectively making Samus invincible while you look for a good time to go on offense. ...an Alpha Metroid? Notice how there are two Metroid shells on the ground. Curious. 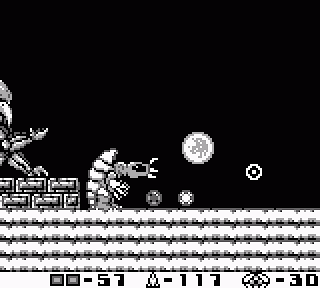 There are no two-on-one metamorphosized Metroid fights in this game, which is a missed opportunity. Still, pretty weird to see an Alpha at this late stage of the game. And lo and behold, leaving and returning to the same room (after looping around the area) reveals the other shell's inhabitant, the first Omega Metroid. It must have stepped out for a minute. This Xenomorph-alike takes a huge amount of punishment to take down and inflicts a lot of damage with acid spit. It's generally easier to take down than a Zeta Metroid, though, since it's easier to hit and stun. I wonder what the lore scenario is for these two Metroids being parked next to each other. One of them is considerably more advanced than the other. It almost seems to suggest that Metroids can have offspring without being a Queen (though only a Queen can create a lot of them at once). As for whether or not one of these is the offspring of the other, we might never know. Maybe. This is one area I'm going to be paying a lot of attention to in the Nintendo remake. ...these creepy upside-down ruins, the lair of the final Metroid. What will it be? When I originally played this, I didn't know Queen Metroids existed, and expected it to be another Omega Metroid. An ominously broken statue holds the Ice Beam, a sign of what is to come. Good day, Plasma Beam. A bizarre pod is seen as Samus rolls through a claustrophobic cave. What's in the pod? Eight more Metroids hatch (presumably - note the counter going from 1 to 9) as Samus traverses the final area. These face-hugging original Metroids are straight out of the egg, and they're pretty ferocious. Good thing Samus has the Ice Beam. First time I played this, I was wondering if the original Metroids would show up at any point, but I mainly wondered that much earlier in the game when the number-counter had a ways to go. Having them all show up at the end was a huge surprise. These really aren't much of a threat at this point, but they're certainly nastier than Alpha Metroids. This is the Queen Metroid, and it's no joke. As a kid, this was horrifying. Hitting it in the center of the mouth stuns it, which is how I was able to defeat it. It takes a good 150-200 missiles to beat, which is a lot more than the Mother Brain in the first game. Alternatively, and this is something I didn't know until this go-around with the game, one can ball up and let the Queen eat them, then lay bombs in her stomach. This does huge amounts of damage to both combatants. She'll quickly spit Samus out, but luckily she isn't too bright and thus quick to repeat the process. Defeating her this way causes her head to crash to the floor. Wow. Winning the missile way (as I always did in the past) causes her to disintegrate. I like that there are multiple approaches to this fight... it harkens back to the original Metroid and the two area bosses. You could use either Wave Beams (through their platforms) or Missiles (up close) to win those fights, and either method resulted in a completely different battle. ...yeah, it's pretty sad in retrospect. Wait a second! Why is the Metroid Counter at 00? Shouldn't it be at 01 again since another one hatched? Maybe it's too small to be detected. ...wait, if the eight new Metroids at the end had just hatched, why were they all bigger than this one? Maybe this one is the runt of the litter. Yeah, that has to be it. The Metroid helps Samus get back to her ship by clearing away all the crystals blocking the passageway back to the surface, and that's it for this game. No timed escape sequence here. Credits roll, and Samus takes the Metroid away, back to the base and whatnot. First time I played this, I was intrigued at what could happen next. Would there be a sequel? Luckily I only had to wait a few months to find out. I played this in July 1993. By December I was starting to give up on news of a new Metroid game (six months felt a lot longer back then) and getting close to begging my mom for an NES so I could play the original Metroid. An NES wouldn't have been a bad move to make at that point, but it would have delayed my getting an SNES for a while. Luckily for me, the January issue of Nintendo Power announced that Super Metroid was a few short months away for the Super NES, and that ended up being what I got instead as a result. Not too shabby! I set a personal record for finishing this game, and we see the sexiest version of Samus ever. Forget skinny-yet-muscular Zero Suit Samus, this shapely redhead (...presumably) is where it's at. This looks like a really great game. Why would baby metroids be less dangerous than older metroids? (Yep I'm gonna non-capitalize them like they're real animals.) That would have to be so they can take care of themselves until they're old enough to reproduce. It's a bit of a surprise more species don't have that kind of growth pattern. Cheers to exploration-type games. Small oversights you mentioned like the hard-to-understand wall and the ticker not going back up to 1 after the baby is born must be things designers didn't think of until the game was already out...deadlines can hurt even the best of us.